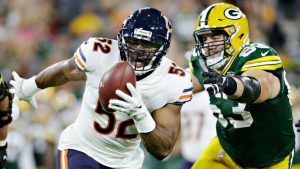 Chicago Bears outside linebacker Khalil Mack was worth every penny of the $90 million guaranteed he signed for with Chicago during the first half of Sunday night’s season opener at Green Bay. “I was pretty confident the Packers would have a hard time blocking him,” Bears defensive lineman Akiem Hicks said. At the 9:22 mark of the second quarter, Mack and Bears defensive end Roy Robertson-Harris broke through the Packers’ offensive line and forced Rodgers to the ground. Robertson-Harris was credited with the sack, and the play resulted in Rodgers leaving the game with a knee injury. Rodgers later returned to start the second half. Later in the first half, with Green Bay’s offense picking up a little momentum behind backup quarterback Kizer, Mack registered a sack, forced fumble and fumble recovery — all on the same play — to thwart a Packers drive that had reached the Bears’ 9-yard line.